AGS Golf Vacations is a member of IAGTO - the global trade association of the golf tourism industry. As an IAGTO member we are committed to offering customers the highest level of service, the best in golf holidays and value for money. Arrive Belfast Airport met by AGS Representative who will transfer you to your hotel. 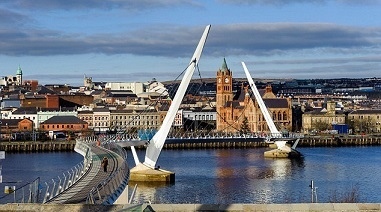 Stay 5 nights at City Hotel Derry. 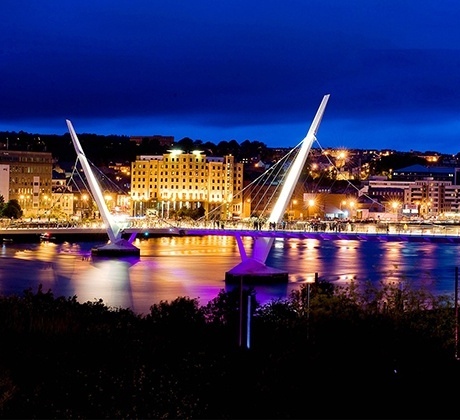 The 4-star City Hotel offers wonderful views of the River Foyle and Derry’s historic Guildhall. All rooms feature free WiFi access, and some also feature work desk and a separate seating area. Thompsons Restaurant serves a creative menu, featuring seasonal and local produce. Guests can enjoy light meals and snacks in Coppin’s Bar, and hearty breakfasts are available daily. City Hotel is just 500 m from the Tower Museum. The famous golf courses at Portrush are less than an hour’s drive away, and Foyleside Shopping Centre is within a 10-minute walk. Castlerock Golf Club is a classic links course set amid the towering dunes on the North Coast of Ireland. Situated on the causeway coast it not only boasts some stunning views down the coastline but proves a great test of traditional links golf. The club formed in 1901 boasts two golf courses onsite, The Mussenden Course and The Bann Course. The course designed by legendary club maker Ben Sayers and Harry Colt is a great test of golf to golfers of any level. To the testament of the course it has held many National Championships both Amateur and Professional through the years.. 18 holes, 6499 yards, par 73. Portstewart G.C. This course originally known mainly for the spectacular first hole has had a major reshaping which led to a rapid rise up the rankings. It is situated on the Causeway coast between Portrush and Coleraine. 18 holes, 6784 yards, par 72. Attend The Open at Royal Portrush. Package includes 2 rounds of golf and 2 x day tickets to the Open for Saturday and Sunday. Proof of handicap required. Maximum handicaps - 24 Men, 36 Ladies. Information pack. Dining recommendations and reservations. We vet the local restaurants and pubs continually. with any trip questions or additionalinfo we can customise this trip further to suit your requirements.